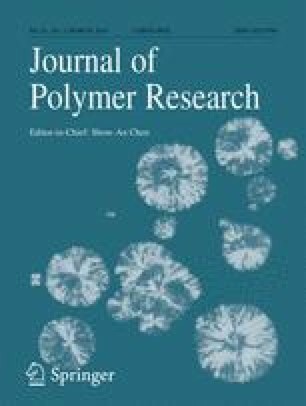 Superabsorbent hydrogel-silver nanocomposite based on poly(vinyl alcohol) (PVA) and sodium alginate (Na-Alg) was prepared using free radical polymerization in the presence of acrylamide (AAm) monomer. The reactions were conducted under normal atmospheric conditions, using ammonium persulfate (APS) as an initiator and methylene bisacrylamide (MBA) as a crosslinking agent. The effect of reaction parameters such as MBA, AAm, and APS concentration as well as Na-Alg/PVA weight ratio on the water absorbency and the gel content of the hydrogels were studied. Evidence of grafting was obtained by comparing the FT-IR spectra and the TGA of the initial substrates with that of the superabsorbent hydrogel. Furthermore, Ag nanoparticles were synthesized in a green synthesis process. Highly stable silver nanoparticles were obtained with the hydrogel networks as nanoreactor via in situ reduction of silver nitrate by using sodium borohydride as a reducing agent. The hydrogel silver nanocomposite was fully characterized by using scanning electron microscopy (SEM), transmission electron microscopy (TEM), and thermogravimetric analysis (TGA). The effect of cross-link density, and Na-Alg/PVA weight ratio on the loading and the size of nanoparticles were studied. The antibacterial activity of the silver nanocomposite hydrogel was investigated as well.